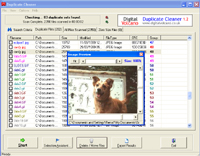 Once again welcome to the freeware world now it is the turn of Duplicate Cleaner which is very efficient and effective software that detects the duplicate versions of the files in the given folder. It is done by the use of CRC32 numbers valued to the files which is used to match the content and then identify the duplicates. It even uses the File size, name, date and any other useful combination of these. In addition it has varied options to choose or preview the list populated as a result of above operation which you can move, delete or clone them. The need comes from cases where you always one or the other way creates duplicate, particularly music files when you try to arrange the collection or classify them. This works on any type of file and tracks all the duplicates in the specified location. It is a formation of combining two programs which are generic duplicate files scanner and the other that scans audio file duplicates. In all cases information of the files is used like audio tags but with an assumption of the names and details being true. Three good things which makes it to be strongly recommended are it uses many dissimilar ways to search for the duplicate files like it can be a CRC value or a name of the file or its size or both or date etc. Detection of audio files that are redundant is done with the tags so no need to worry of possibility to have a flaw. Third and final reason is large variety options that are good enough and are based on the results generated after the search. You can open the file, delete, move, import, export and surprisingly clone them by creating hard links from the result list. So its unique feature and dynamic nature lies in its ability to provide lot of options to do with the results.